Established in 1992 by Los Angeles’s Center Theatre Group, the Latino Theatre Initiative sought to diversify audiences by diversifying theatrical programming. Until 2005, when it was suspended, the program resulted in the production of eleven new main-stage plays at the Mark Taper Forum. It was also key in the development of new and emerging Latino artists, the production of second-stage works, and the incorporation of community-based events into theater programming. 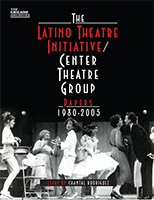 Chantal Rodríguez draws on the extensive Latino Theatre Initiative/Center Theatre Group Papers, 1980–2005, housed at the UCLA Chicano Studies Research Center, in this first extended historical account of the program. Rodríguez evaluates the Initiative’s successes—and shortcomings—and examines the roles played by its leaders and its significant roster of artists. A finding aid for the collection and a selected bibliography round out the volume. 29 black and white illustrations.